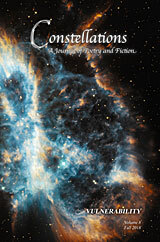 Constellations is a print literary journal based in the Cambridge/Boston area, featuring poetry and short fiction. We seek writing that is fresh and resonant, and look forward to reading work from our local literary community as well as elsewhere. UPDATE March 15, 2018: We are now open for submissions and would love to read your work for possible inclusion in volume 9: CONFESSION. Please carefully read our submission guidelines before sending material. Meanwhile, Constellations volume 8: VULNERABILITY is still available, featuring poetry, fiction, art, and photography from a record-breaking 62 contributors. The issue is available via Amazon.com in the U.S., Amazon.co.uk, Amazon.fr, Amazon.de, Amazon.es, and Amazon.it in Europe, and Amazon.co.jp in Asia.